Now you can get up-to-the-minute product information with a simple glance at your wrist. Our new experience for the Apple Watch has been designed to integrate seamlessly with our existing QVC for iPhone® app. 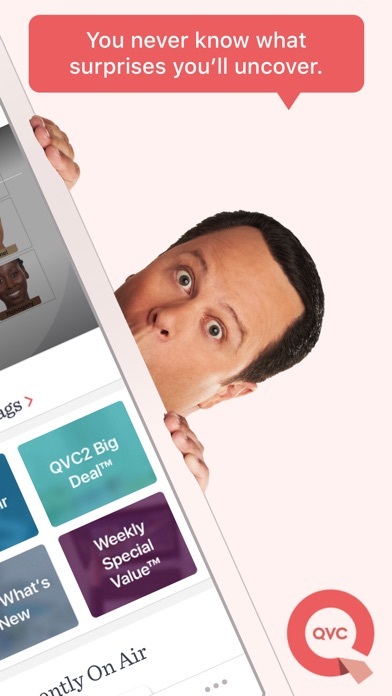 Simply download the updated QVC app on your iPhone and you’ll be able to sync the experience you already know and love to the brand new Apple Watch. 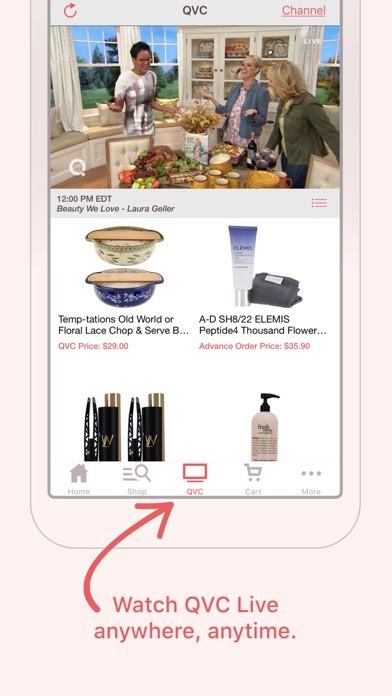 Get more of what you love with the QVC for iPhone® app that anyone can download for free. The My Account feature lets you access more order information than ever. You can track your order, edit Easy Pay® options, manage your address book, and more. Plus, as always, never miss our Today's Special Value®—our best find of the day, good for one day only. • Glance – The new glance feature on the Apple Watch allows you to scan Item On Air information on the fly. 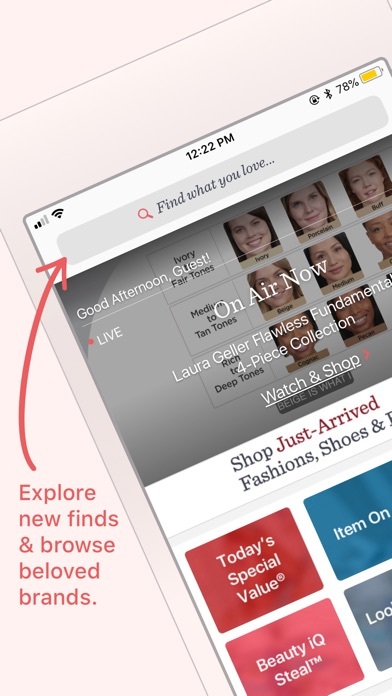 • QVC App for the Apple Watch – Access our app directly from the Apple Watch home screen for Item On Air and Today’s Special Value® information. • Touch ID fingerprint authentication support for iPhone 5S, iPhone 6, and iPhone 6 Plus devices running iOS8 or higher. • Watch our full 16:9 HD live stream and purchase the current Item On Air. 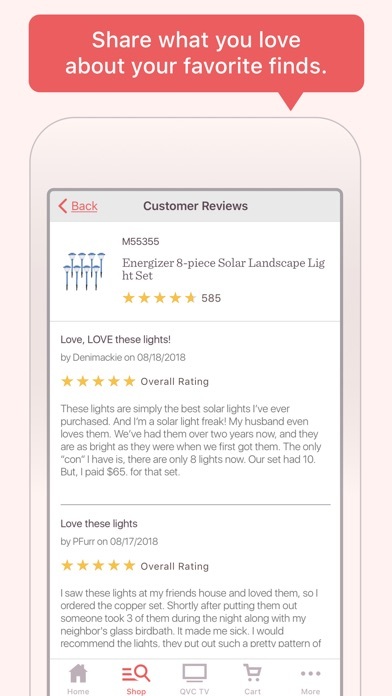 • See customer ratings & reviews on our product detail pages and product listings. Plus on our enhanced product detail pages, view product images, information, sizing, color swatches, availability and delivery date estimates. 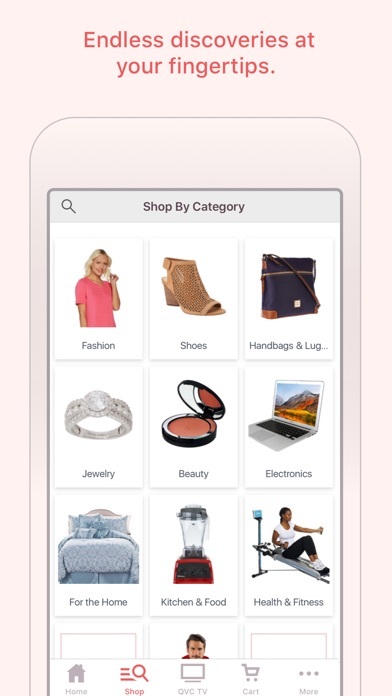 • Find exactly what you're looking for with our full-search capability – search over 100,000 items by category, item number, product description, brand, phrase, or word. 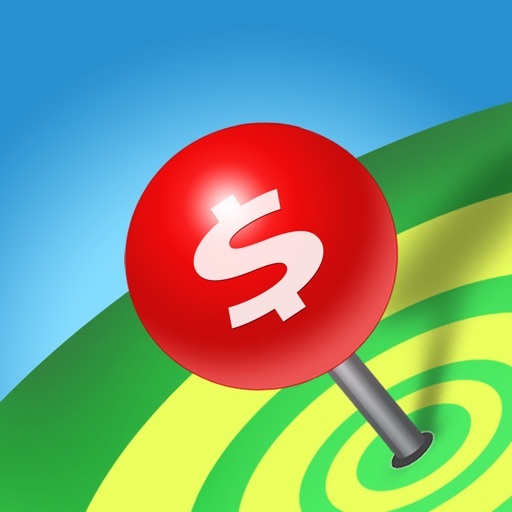 From there, you have the ability to narrow those search results. • On our Homepage, find our Today's Special Value offer, One Day Only Price™ offers, and current Item On Air, plus Items Recently On Air, and featured promotions. • Narrow the Items Recently On Air product listing by show. • Enjoy Buy More, Save More offers. 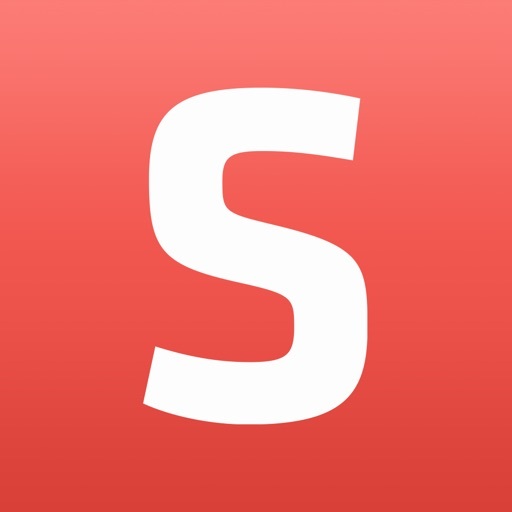 • Share items via Facebook or Twitter. Email an item to your friend or to yourself as a reminder to view a product later. 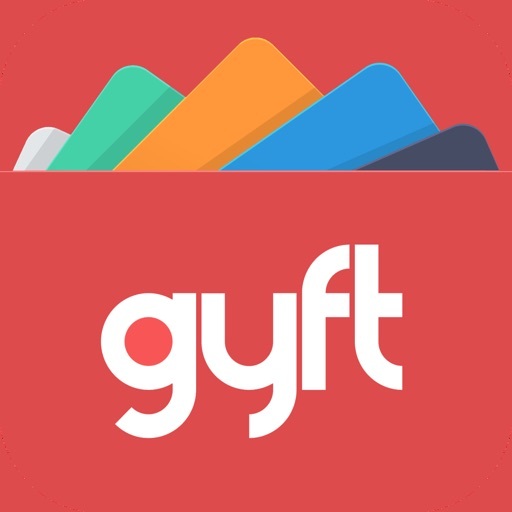 • Speed Buy® to purchase items quickly and confidently! New customers can easily create an account—anytime, anywhere. 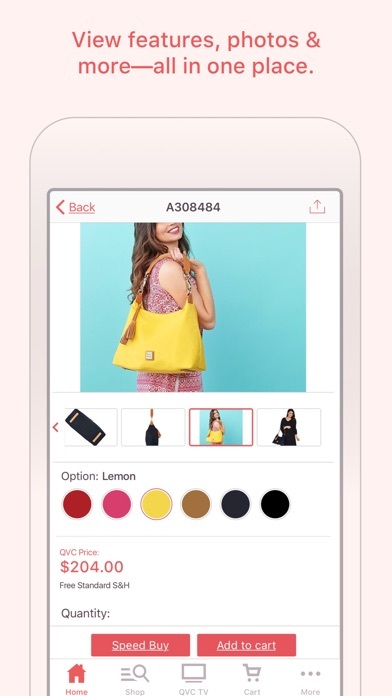 Our app can also save your email address for faster purchases in the future. 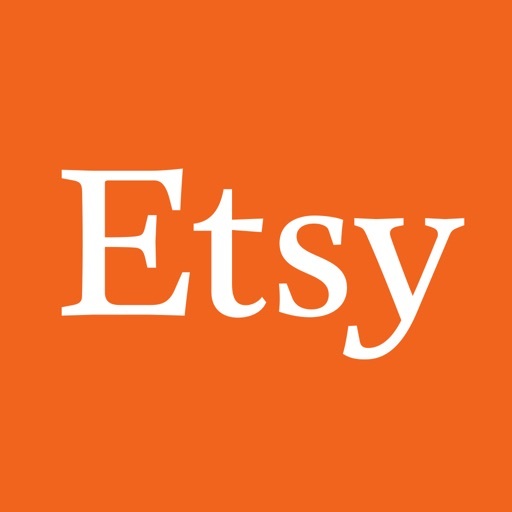 • Check your order status, edit or cancel orders, and manage Auto-Delivery. • Update your personal information, manage your address book, and view/edit Easy Pay options. • Access and shop your Wish List. Award-winning Service: We've been honored multiple times with BizRate's "Circle of Excellence" distinction. 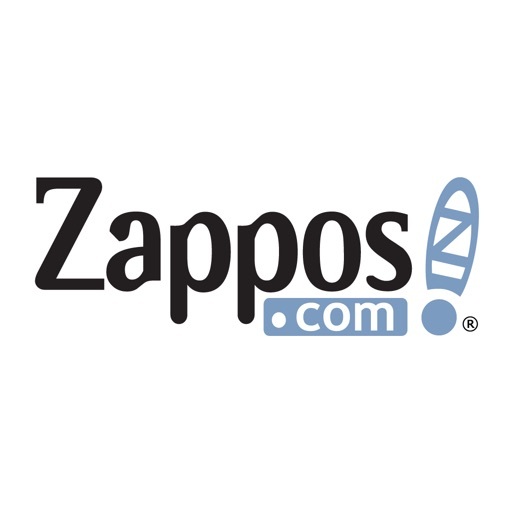 We've also received Shopping.com's "Trusted Store" Seal, a prestigious vote of customer confidence awarded to online merchants. 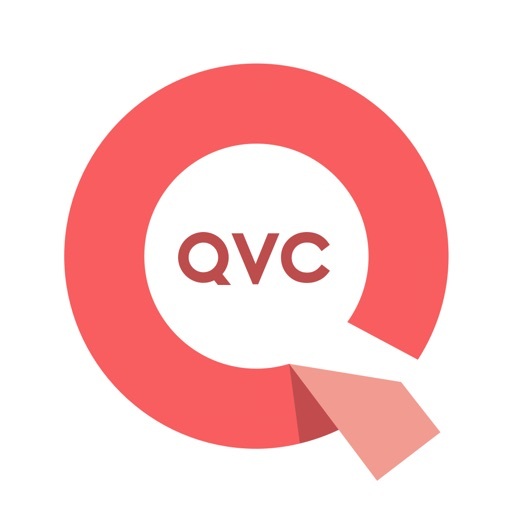 QVC is committed to giving you quality service and treating your information responsibly. For details, please see our Privacy Statement. 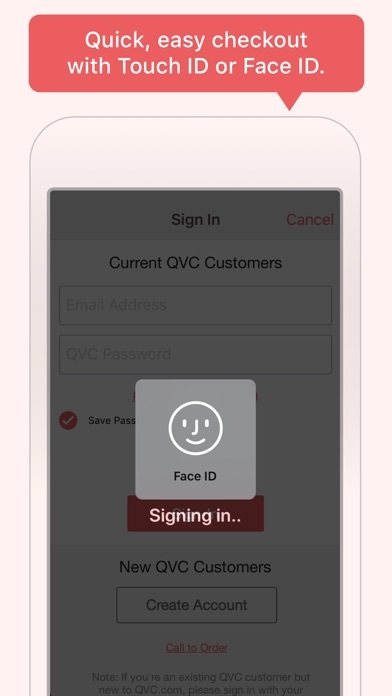 QVC is VeriSign Secured, so you can feel confident while shopping with us. We participate in the VeriSign Secured Seal Program. 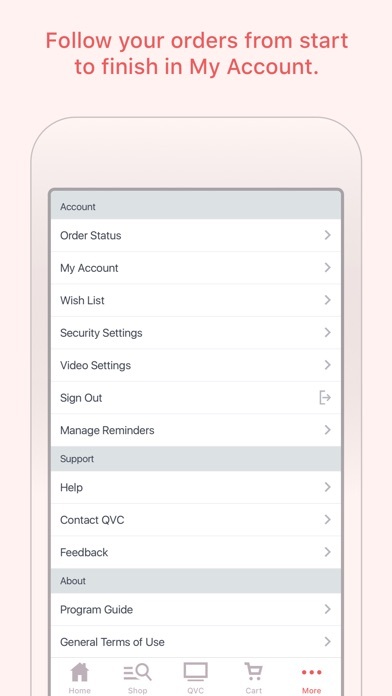 All of your personal information is encrypted by Secure Sockets Layer (SSL) software when it's transmitted to us during the checkout process, just as it is on QVC.com. Also, your QVC PIN is never stored on your device. Watching QVC's video stream may significantly increase the data usage amount of your mobile device and may incur additional fees. Contact your carrier for more information. I can always count on QVC to get a great deal. Love the channels good quality in their different lines & products. Love the ease of shopping. Simple and easy to use enjoy shopping, there was no hassle. I have always had trouble growing strong nails that would not bend or peel. This product has helped so much and I love it. I have had very few experiences that match the quality of those at QVC. I don’t know where you find your customer service representatives or how you train them but they are about the best I have encountered. They are knowledgeable, polite, and efficient. I really appreciate this facet of my QVC experience. 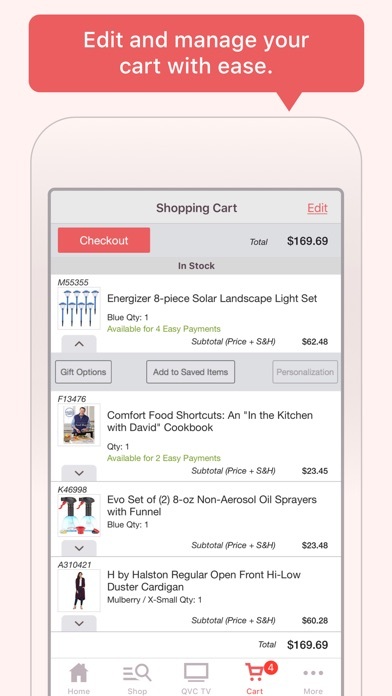 QVC app makes shopping a breeze! It is always easy to use the Qcard with information already entered-makes for quick process with little chance of error.